Ogawa’s first solo show at the Frantic Gallery (formerly known as art project frantic) is an impressive start for the twenty four year old artist. His painting thrives on clashing the opposites: dense, clustered fragments and open spaces, impasto brushwork and mirror-smooth varnished surfaces, figuration and rhythmical patches of color. The largest work in the exhibition “Emphasizing the One Who is Absent” (2009) is positioned, both physically and metaphorically, as a portal into the Ogawa's meta-spaces. This painting-within-a-painting shows an empty white chair set against the background of another canvas that is in the process of falling apart. Pigments explode, smudge off, lift away and the three-dimensional space around the chair is taken over by a barrage of color and action. 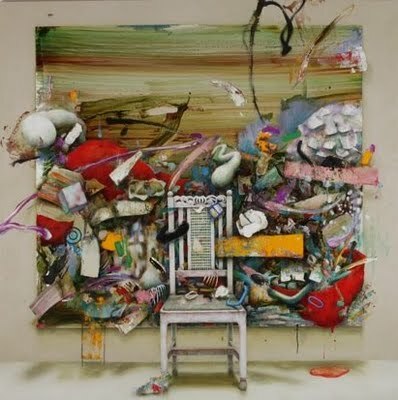 Juxtoposing the trompe l’oil of the chair with the representations of painterly markings, shapes and traces, Ogawa constructs his own pictorial space, and a temperamental one at that. For as long as you look at the paintings they challenge and engage, not allowing a moment of the prerequisite calm that would make them into passive objects of your gaze. Practically all the pieces in the exhibition give the impression that the action inside and outside the canvas’ transpires regardless of the viewer's presence. This is most visible in the series of works where animals (rabbits, tigers, frogs) are shown as they escape the confines of their respective paintings only to look back so they can tease the now barren canvas. Irritated Figures is curated by Rodion Trofimchenko whose dynamic interpretation of Ogawa’s work goes beyond simply framing the art, and functions as a parallel text of sorts, at once obfuscating and enlightening. As Trofimchenko explains, the irritated images square the artist against both Japanese pop culture and Japanese contemporary art. I must agree that Ogawa’s work for all his incorporation of the traditional Japanese technique and design, at least as they appear in the final product, is rooted in Conceptual art. The best example of this is the stunning silk screen/painting “Play on his own” that contains the artist’s likeness from some twenty two years before and, hovering above his head, a cluster of objects and color markings, an intense vision of a memory (or a premonition) fully unfolded in the pendant painting the “Accumulation of Rhythms” (both 2009). The works in the exhibition show a clear progression from the earlier pieces that engage mid-career Francis Bacon, to the later spatial gymnastics in “Emphasizing the one who is absent” and the “Accumulation of Rhythms.” Here, of course, fingers could point to Wassily Kandinsky’s experiments circa 1915, but Ogawa’s formalist conceptualism so evident in the 2009 “Floating Rhythm” puts his exploding colors and irritated figures into a category of their own. Ogawa is certainly one young artist to watch.